The Food Alphabet and More: Feel the Love at IHOP this Valentines with Red Velvet Pancakes! 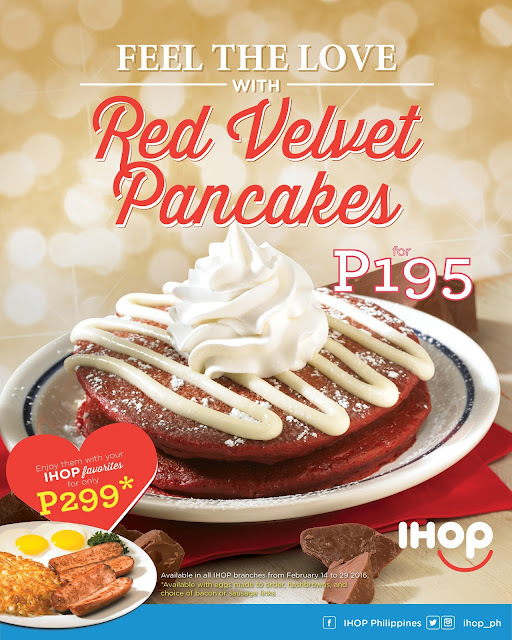 Feel the Love at IHOP this Valentines with Red Velvet Pancakes! Red Velvet pancakes this Valentines! Valentine Season is always a big deal at the International House of Pancakes, better known as IHOP. That’s why this year, all IHOP branches worldwide including IHOP Philippines will be offering their NEW Red Velvet Pancake Combo: 2 pcs. Red Velvet Buttermilk Pancakes, 2 Eggs Made to Order, Hash Browns, and 2 Strips of Bacon or 2 Sausage links all for the loveable price of only P 299! IHOP Philippines’ Red Velvet Pancake Combo will be available for a limited time in all their branches from February 12 to 19, 2016 only so hurry and feel the love in the air with this breakfast meets dessert can’t miss combination! First established in Toluca Lake California in 1958, IHOP or the International House of Pancakes serves a wide variety of breakfast, lunch, and dinner items loved by people of all ages. Although their World famous Buttermilk Pancakes made them a global icon, their wide range of deliciously fresh and made to order food coupled with their warm, friendly, and intuitive service all work together towards fulfilling their promise of Spreading Happiness to each and every one of their guests.